A little Valentine's Day Blush! Soft and romantic is how I describe the shade of these dreamy gowns! Ruffles and layers and rosettes... oh my! Doesn't it make you feel like you're floating on a cloud??? Stunning detail on this wedding gown! What a beautiful Gatsby inspired wedding gown! Add a touch of glam to your special day and wow all of your guests! ~Tip Tuesday~ Work with what you got! There are millions and millions of wedding dresses to choose from out there and no doubt it can be one of the most overwhelming decisions of wedding planning for brides. So many things to consider!!! Silhouette, neckline, fabric, colour and detail. Start simple and research what style you like and what suits YOU best, For example, princess style gowns flatter almost everyone, but mermaid cuts works best with taller brides. Don’t feel like you need to spend thousands of dollars on a top designer dress....especially since you will only be wearing it for one day. A great option is to buy used and you can have it tailored to fit perfectly without having anyone know! Don’t feel as if you have to go with what has been done; wear what YOU want and what YOU like. If you feel white is not the colour for you, go for a shaded dress. If you are not liking the length... gof for a shorter dress. Keep in mind, this is YOUR day YOU pave the way! 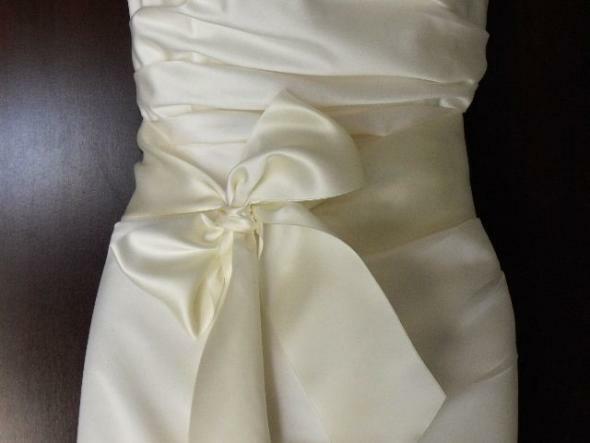 Book an appointment- Most bridal shops need to know in advance so they can pair you with a Bridal consultant. Have an idea in your head what you are looking for, but be open to options. Veil, no veil, lace, beading, elegant or bold???? What you come in the salon with may not be what you leave with! Stick to your budget. You don't want to to be disappointed in the end when you have fallen in love with a dress that is going to break the bank! We hope you are able to enjoy the Wedding Dress shopping experience.... the thing to remember... don't let it overwhelm you! Enjoy the moment and you will find the perfect dress for you! 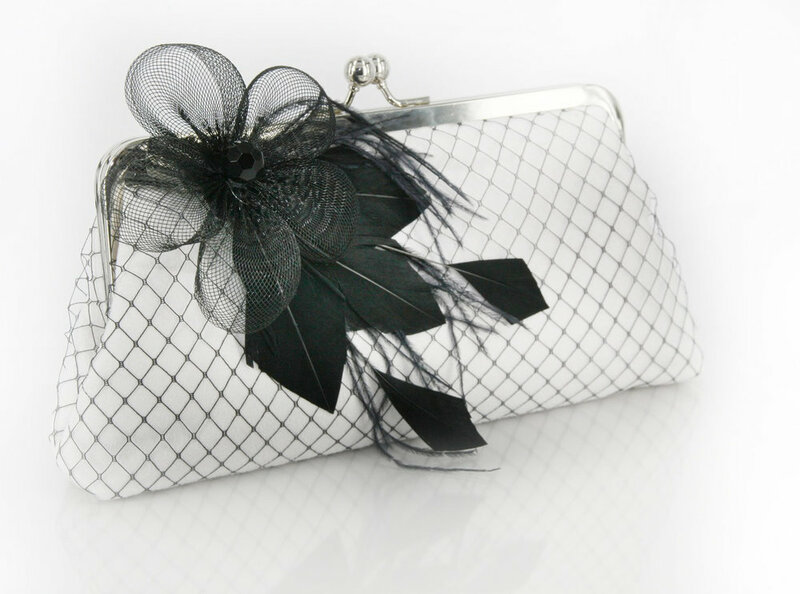 Style Wednesdays~ Black+White Wedding Attire! There is something about a "black tie" event.... so formal, with a crisp, clean colour palette. Adding to the classic black look, is what you wear to the event! Ladies - you're going to love this!!! Today we are sharing some classic looks as well as some twists on the black party dress! Also we can't forget the accessories!!! We are in love with the back of this dress!!!!!!!!!!! These next two dresses...... Jaw-dropping!!!! So many choices!!!! How does a lady choose???!!! It's even harder if you add a pop of colour to the mix! We are fans of the black and white wedding style but the extra pop of colour just takes the whole vision one notch further! Hope you enjoyed today's lovely eye candy! Are black and white the colours for you? "refined elegance with a bit of Latin excitement thrown in..."
These words just about sum up the collection of Fall 2013 Liancarlo bridal gowns hitting the runways. We love the intricate hand-work detail in each of the gowns. This designer really does bring his "art to life"... see for yourself the beautiful creations full of luxurious fabrics + textures that graced the runways this October! Be inspired ladies!!! You may just find the dress of your dreams! Our favourite of the bunch! Love the blush shade! 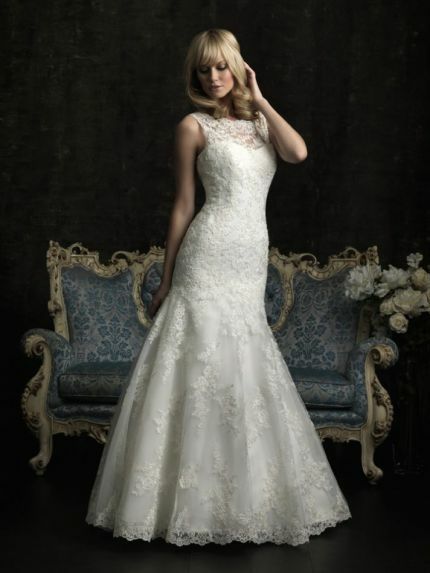 Gowns with high, elegant necklines appeared in many of the 2013 bridal collections. Now this is a trend that we just love! Classic. Elegant. Romantic. Some of the designs are a little reminiscent of Jackie O don't you think? A welcome alternative to the strapless gown, high necklines still keep the romantic, feminine and modern feel that brides are looking for. Here are just a few that inspired us and would love to share! Let us know what you think! Our favourite of the day..... seriously gorgeous. Love, love, love the rich satins, soft tulle, fitted silhouettes and heavenly lace. That about sums it up for us! 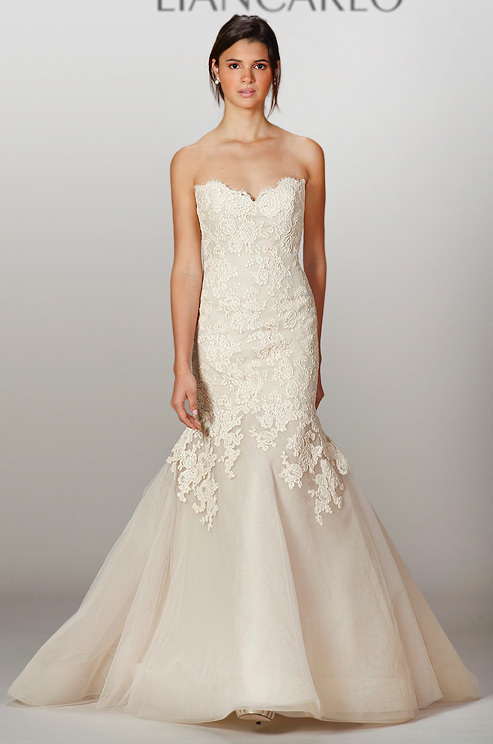 Today's designer spotlight features Allure Bridals. For the 2013 season, they have kept up with the trends for the coming year yet still have created a timeless and classic collection that is sure to get you in the 'romantic' mood! The subtle shades of colour take the dramatic factor up a notch and really makes the bride that centre of attention! Still searching for that perfect gown??? You may not need to look any further. Check out the designs that are just some of our faves! Sound off below and let us know which ones strikes a chord!!! This one is absolutely stunning!!!!!! 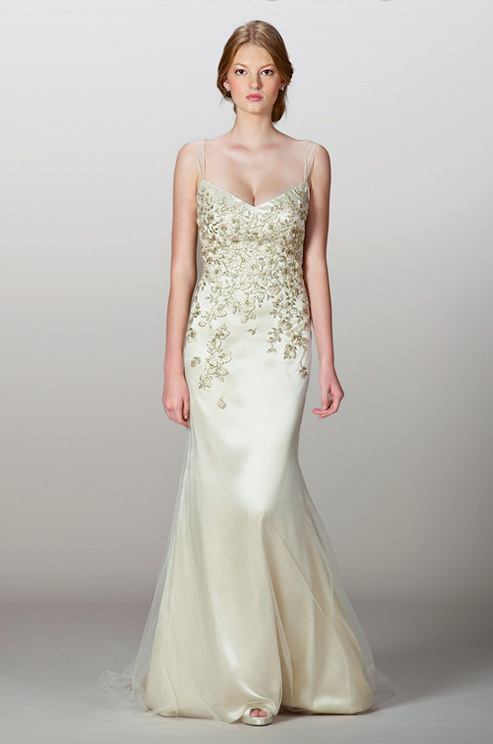 Today's wedding gown feature shines the light on designer Douglas Hannant. 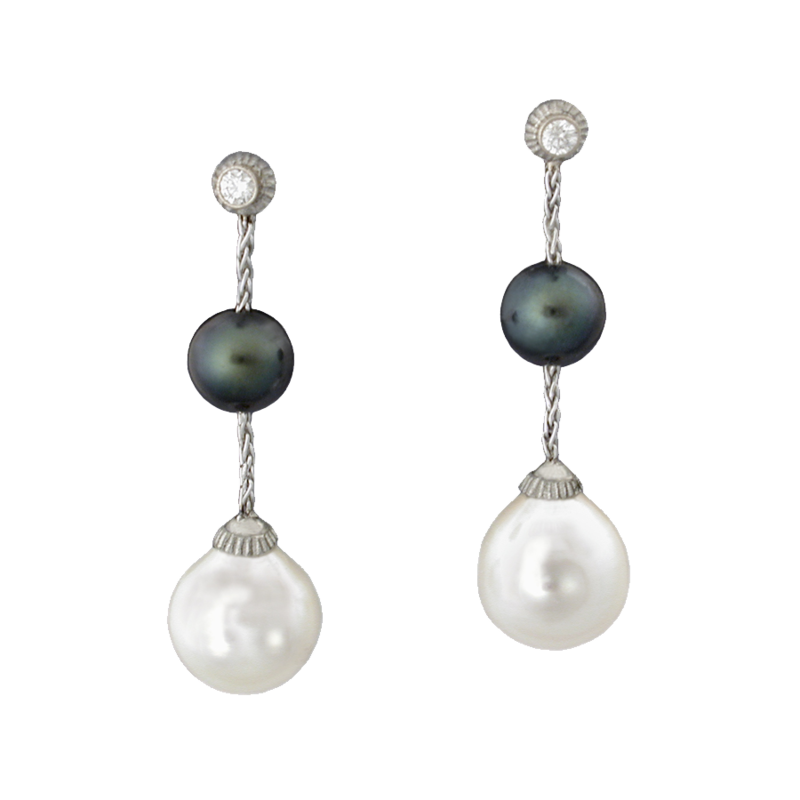 Hannant's creations are modern yet still keep that classic feel. Leaning towards "chic" rather than glamour, this collection focuses on the understated "wow factor". Being able to to turn heads when you walk in a room without being "celebrity glamourous" is what this designer tries to achieve. We love what we have seen so far in this collection and look forward to so much more! Enjoy they eye candy we have for you today! This post is all about the non-traditional bride and her out-of-the-box ideas for her big day. In keeping with the "Halloween" theme today, we are looking at the not-so popular choice in wedding dresses. Black! Although not all of reader brides out there would be up to considering these, you might just be inspired to put that little bit of colour into your wedding attire .....and be pleasantly surprised. The mere mention of black wedding gowns will get you a few surprised expressions and raised eyebrows. Not the first colour that pops into mind for a wedding dress but colour is slowly creeping into the wedding fashion coming off the runways! For the bride who wants a little whimsy! Now this dress is absolutely stunning!!! Be daring and make your wedding your own... even if it means ruffling a few feathers! It's Wednesday ladies! Half way through the week! 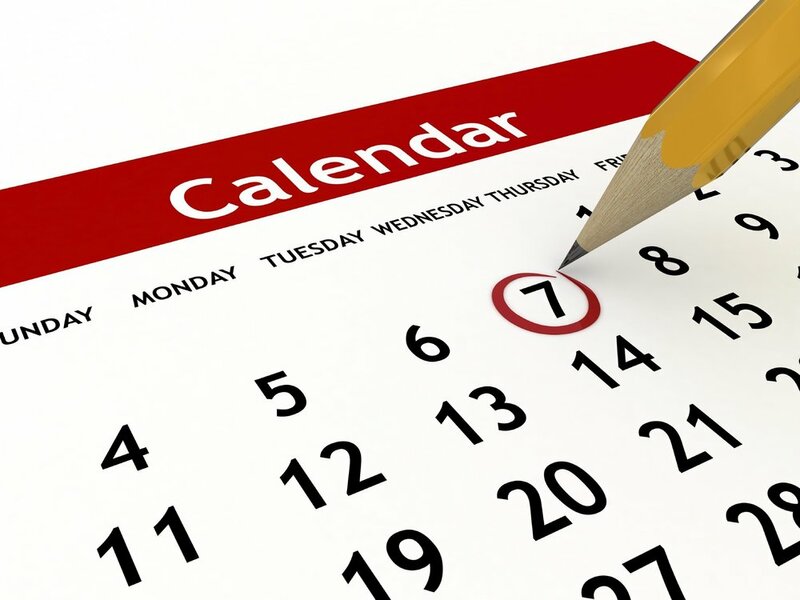 For some of you a weekend of "wedding planning" lies ahead. 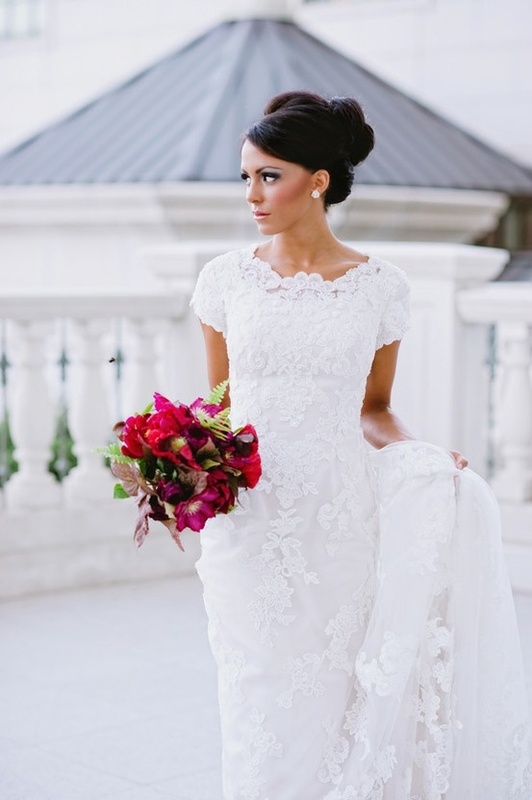 To get you there, we've got some alluring and glamourous wedding gowns to share with you! Our designer spotlight focuses on the extremely talented Monique Lhuillier. 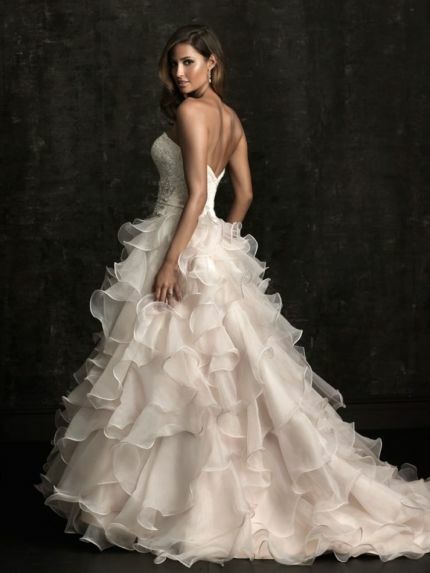 A balance blend of classic, stylish and inventive designs, Monique Lhuillier has wowed the masses again. 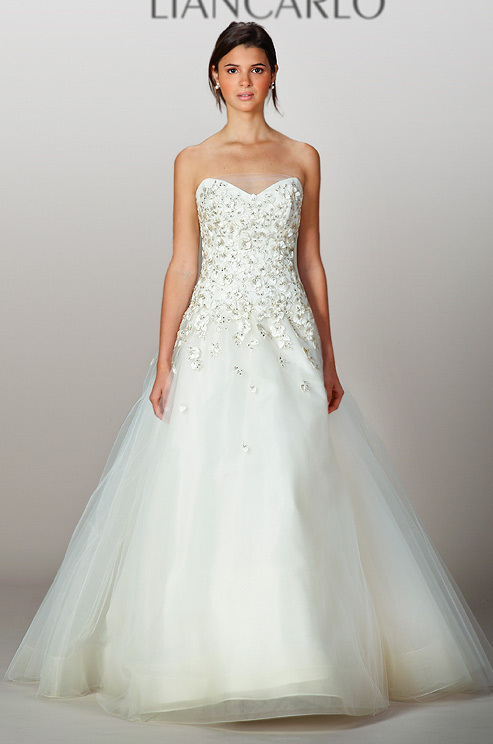 We hope you enjoy the Monique Lhuillier designs for Spring 2013! ~Trendy Mondays~ One Day, Two Dresses.. Why not! More and more brides are straying away from tradition and opting to wear two dresses on their wedding day. Who says you have to stick to just one??? Have the wedding gown style for the ceremony & cocktail hour and then switch to a more upbeat number for the reception. Something to have a little more fun and party it up! There are a few ways this can be achieved. You can have the two different looks you desire by using "layers" such as jackets or cover ups for the earlier part of the day and then shedding that to have a more flirty and fun look for the evening celebrations. Here are some ideas! Here is another take on layers! A lot of designers are offering brides the option to transform their look by transforming the gown itself. This sounds fun! Creating a gown where the skirt can be easily detached to reveal a fun cocktail style party dress is sure to wow your guests and not to mention your new husband!!! 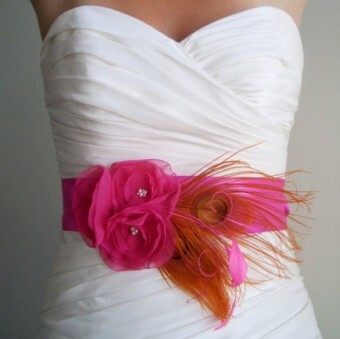 Another subtle and simple way to change up your look is to play with the sash on your dress. Have a more understated, elegant colour for your ceremony and change it up to a playful and bold choice for your party! And now for some COLOUR!!!! Time to kick the party into gear! 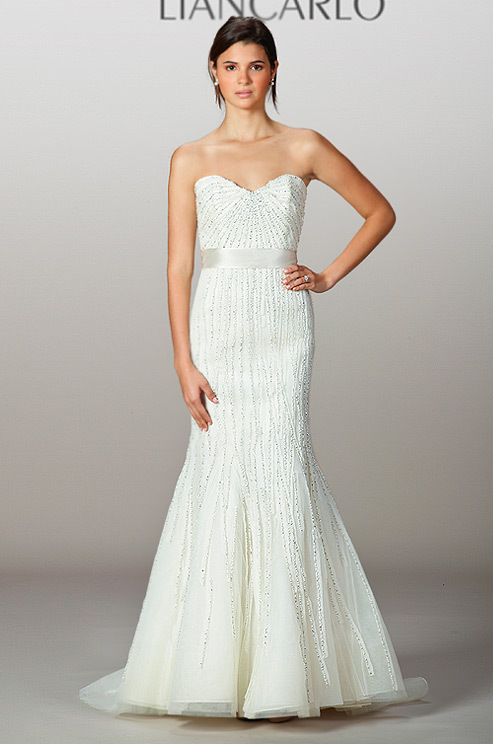 What you should remember when choosing your second dress is that it shouldn't break the bank. It doesn't have to be expensive and the more different it is from your normal wedding gown, the more fun you'll have! Will you say "Yes" to the second dress???? Let us know!